You detect an object flying at your head. What do you do? You probably first move out of the way -- and then you try to determine what the object is. Your brain is able to quickly switch from detecting an object moving in your direction to determining what the object is through a phenomenon called adaptation. A new study in the Nov. 21 advance online edition of the journal Nature Neuroscience details the biological basis of this ability for rapid adaptation: neurons located at the beginning of the brain's sensory information pathway that change their level of simultaneous firing. This modification in neuron firing alters the nature of the information being relayed, which enhances the brain's ability to discriminate between different sensations -- at the expense of degrading its ability to detect the sensations themselves. 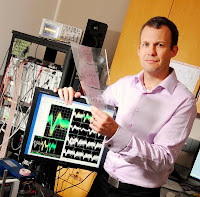 "Previous studies have focused on how brain adaptation influences how much information from the outside world is being transmitted by the thalamus to the cortex, but we show that it is also important to focus on what information is being transmitted," said Garrett Stanley, an associate professor in the Wallace H. Coulter Department of Biomedical Engineering at Georgia Tech and Emory University. For the experiments, Stanley and Wang moved a rat's whisker to generate a sensory input. Moving whiskers at different speeds or at different angles produced sensory inputs that could be discriminated. This sensory experience is analogous to an individual moving a fingertip across a surface and perceiving the surface as smooth or rough. While the whiskers were being moved, the researchers recorded neural signals simultaneously from different parts of the animal's brain to determine what information was being transmitted. "Neuroscientists know a lot about different parts of the brain, but we don't know a lot about how they talk to each other. Recording how neurons are simultaneously communicating with each other in different parts of the brain and studying how the communication changes in different situations is a big step in this field," said Stanley. "Adaptation differentially influences the thalamus and cortex in a manner that fundamentally changes the nature of information conveyed about whisker motion," explained Stanley. "Our results provide a direct link between the long-observed phenomenon of enhanced sensory performance with adaptation and the underlying neurophysiological representation in the primary sensory cortex." "There is a switching of the circuit to a different function. The same neurons do two different things and switch quickly, in a matter of seconds or milliseconds, through a change in the synchronization across neurons," explained Stanley. "If we think of the neurons firing like members of an audience clapping hands, then the sound of the clapping becomes louder when they all clap together."